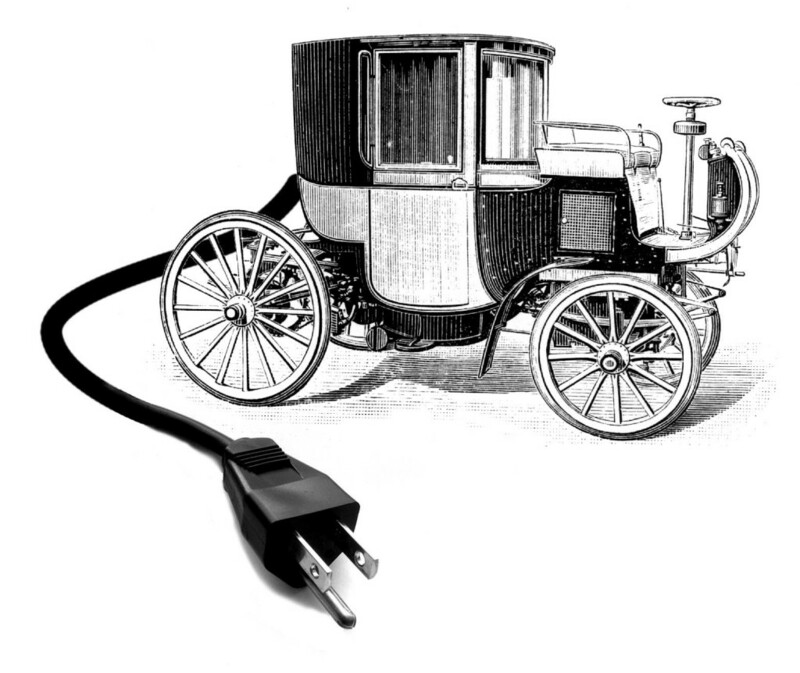 Offering incentives or reduced costs may encourage more people to buy plug-in cars. Cars and light trucks in the U.S. consume about eight million barrels of gasoline per day, more than total US petroleum production. They account for eighteen percent of national greenhouse gas emissions. Both motor vehicle gasoline consumption and emissions have been rising at about 1.5 percent per year. Plug-in hybrid electric vehicles (PHEVs) could alter these trends. On a vehicle technology spectrum that stretches from fossil-fuel- powered conventional vehicles through hybrid electric vehicles to all-electric vehicles, PHEVs fall between hybrids and all-electrics. They have both gas tanks and batteries, like hybrids, and can run either in gasoline-fueled mode or in electric mode. Their batteries are much larger than batteries in other hybrids, and they can store electricity directly from the grid as well as electricity derived from regenerative braking, as do conventional hybrid vehicles. PHEVs combine the best aspects of conventional vehicles (long range and easy refueling) with the best attributes of all-electric vehicles (low tailpipe emissions and reduced petroleum use). Widespread use of PHEVs could reduce transportation-related GHG emissions, improve urban air quality, reduce petroleum consumption, and expand competition in the transportation fuels sector. Several companies now offer to convert hybrid vehicles to PHEVs, and several automakers have announced PHEV development projects. However, there’s a downside: cost. Because of their large batteries, PHEVs currently are much more expensive than either conventional vehicles or hybrids. Under today’s market and policy conditions, the expected savings in fuel costs are not enough to compensate consumers for their high prices. Therefore, PHEVs could be consigned to a small or non-existent market share unless something changes. In the following pages, we compare costs, energy consumption, and emissions of these different vehicle types. We look at a conventional vehicle, a hybrid-electric vehicle, and two different PHEVs—one that can travel twenty miles on grid-supplied electricity (called a PHEV20) and one that can travel sixty miles (a PHEV60) without recharging or using gasoline mode. We consider both compact and full-size SUV models. We assume that the PHEVs require batteries that can store and deliver large amounts of energy for distances and for the high-power driving needed in urban areas, but that they are otherwise similar to conventional vehicles. While PHEVs are much more efficient at using gasoline than conventional vehicles, they are only slightly more efficient than hybrids. Thus almost all of the benefits of convert- ing from hybrids to PHEVs would depend on whether they can be driven on cheaper and cleaner electricity. 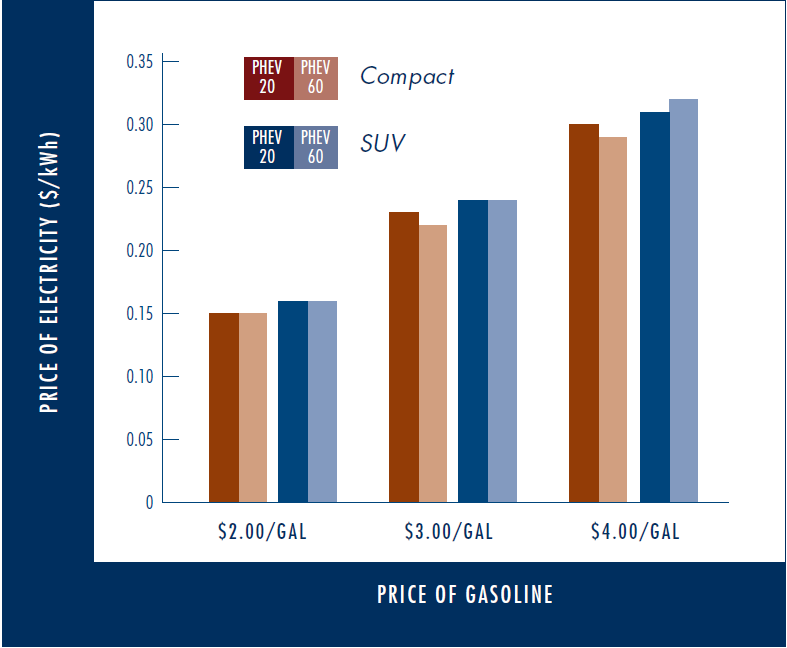 Figure 1 shows electricity rates that provide the same cost per mile as various gasoline prices. Lower electricity rates than the ones shown would encourage PHEV owners to drive in electric mode, while higher rates would favor gasoline-fueled hybrid-electric mode. The equivalent cost per mile of $3-per-gallon gasoline is 22 to 24 cents per kilowatt hour (kWh). For comparison, in 2006 US residential electricity rates averaged about $0.083 per kWh, and US gasoline prices averaged about $2.75 a gallon. Thus, under current prices, electric operation would save money. The question is whether the fuel cost savings over the lifetime of the vehicles are enough to offset PHEVs’ higher capital cost and provide an incentive for their purchase. Currently, electric vehicles cost more than conventional vehicles because batteries are expensive. Their price must fall substantially for consumers to be able to recoup costs by saving fuel. To compare the very different modes, we assume that batteries represent the entire difference in cost between PHEVs and conventional vehicles, and that they will last the entire twelve-year vehicle lifetime. We also assume that the vehicles are driven 11,000 miles annually, that PHEV20s drive 39 percent of their miles in all-electric mode, and PHEV60s drive in all-electric mode for 74 percent of their miles. We show the resulting break-even costs for the purchase of hybrids and PHEVs at various gasoline prices in Figure 2. Battery prices would have to fall substantially from their current price of about $1300 per kWh, or gasoline prices would have to be substantially higher than the upper range of $4 a gallon shown in the graph, for consumers to recoup the costs through fuel savings. Consumers’ break-even costs are far lower than hybrid or PHEV battery prices, so fuel savings alone would not offset the vehicles’ increased capital cost and thus justify their purchase. Hybrids and PHEVs offer prospects for considerably lower greenhouse gas emissions. The efficiency gains achievable from simply replacing a conventional vehicle with a hybrid are significant: 23 percent lower GHG emissions for compact hybrids and 34 percent lower emissions for SUV hybrids compared to their conventional counterparts. For PHEVs, however, the extent of the emissions reduction depends on how the electricity used to charge the battery is produced. To determine greenhouse gas emissions savings from hybrids and PHEVs, we com- bined a well-to-wheels assessment of the transportation fuel sector with GHG emission data for the full fuel lifecycles of a number of different power plant types. Then we calculate the emissions of each vehicle type when operating in gasoline mode and, when applicable, in electric mode. Figure 3 shows our results. If the electricity comes from very low-GHG plants, such as wind turbines, nuclear plants, or integrated gasification combined-cycle (IGCC) plants with carbon capture and sequestration, PHEVs could reduce GHG emissions by as much as 85 percent relative to conventional vehicles under average driving conditions, and by nearly 100 percent when driven only in electric mode. However, a more accurate analysis must recognize that PHEVs would create new electricity demand and thus would be responsible for electricity produced by “marginal” power plants, those needed to meet this additional demand. 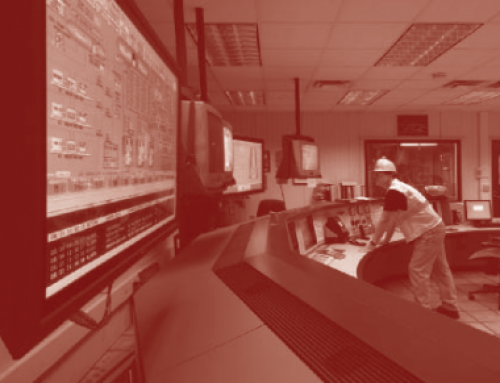 In the US, marginal plants are often thermal plants burning natural gas (NGCC in Figure 4). If PHEVs are operated with electricity from natural gas, compact and SUV PHEVs reduce emissions by 54 and 61 percent relative to their conventional vehicle counterparts. In some US regions, however, the marginal power plant is a coal plant. 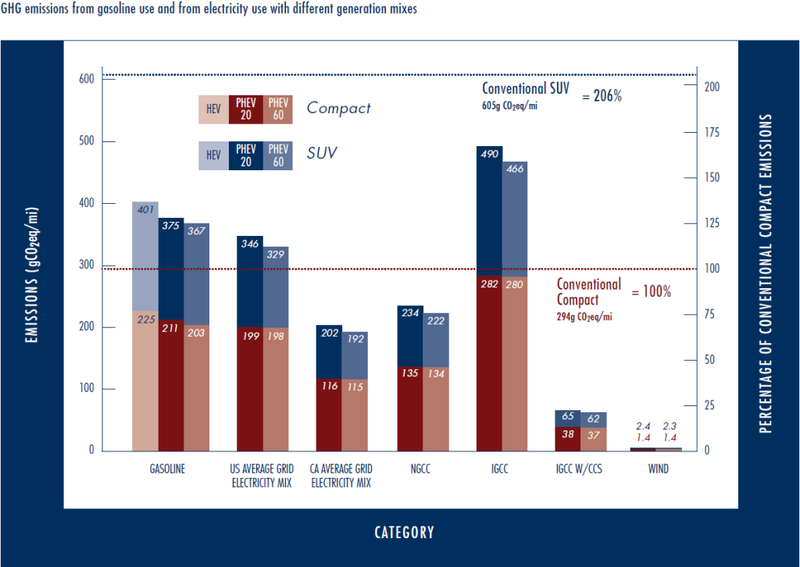 If PHEVS are operated on IGCC coal electricity without carbon capture and sequestration, compact and SUV PHEVs reduce greenhouse gas emissions by only four to nineteen percent relative to comparable conventional vehicles. In this case GHG reductions are actually less than those achieved by hybrids running on gasoline (23 and 34 percent, respectively). Thus, when the marginal power plant is a coal plant, it is always better from a GHG perspective to drive a hybrid or a PHEV in gasoline-fueled hybrid electric mode rather than in grid-supplied all-electric mode. In the long run, if PHEVs become numerous enough to lead to new investment in electricity generation, an analysis using average emissions from all power plants would be reasonable. We include the current US average and California average electricity grid mixes in Figure 3 for purposes of comparison. PHEVs would perform better in California because California power uses relatively little coal, but in other cases emissions savings would not be as good as our NGCC example. However, high market penetration of PHEVs is likely to take ten years or more, and over that time period power plant regulations also could change significantly, presumably toward lower emissions from power production and hence better emissions gains from switching to PHEVs. If fuel savings alone don’t justify the purchase, how big must a subsidy or monetary incentive be to induce a cost-conscious consumer to buy a PHEV? Would the greenhouse gas benefits of PHEVs justify such a subsidy? 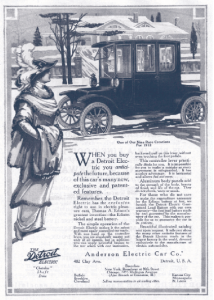 To address these questions, we calculated the necessary subsidy as the difference between the marginal vehicle cost and the marginal fuel savings (assuming a base case of ten cents per kWh electricity, $2 a gallon gasoline, $1,000 batteries, and a sixteen percent discount rate on future fuel savings). We then separately tested the effects of a $200 battery, lower emissions from electricity production (using wind instead of NGCC), and a higher gasoline price ($4 a gallon instead of $2). Finally, we tested what would happen if regulatory agencies charged $100 per metric ton for carbon emissions (currently most such carbon emissions prices range from $20 to $50 per metric ton). $100 per metric ton of CO2—making this strategy a costly way to reduce greenhouse gases. The analyses for low-GHG electricity and for gasoline price reinforce this conclusion. And a carbon price of $100 per metric ton of CO2 does not have much of an effect. Thus, we conclude that a carbon tax or economy-wide GHG cap-and-trade system would not be particularly helpful in making PHEVs a cost-effective greenhouse gas mitigation option. 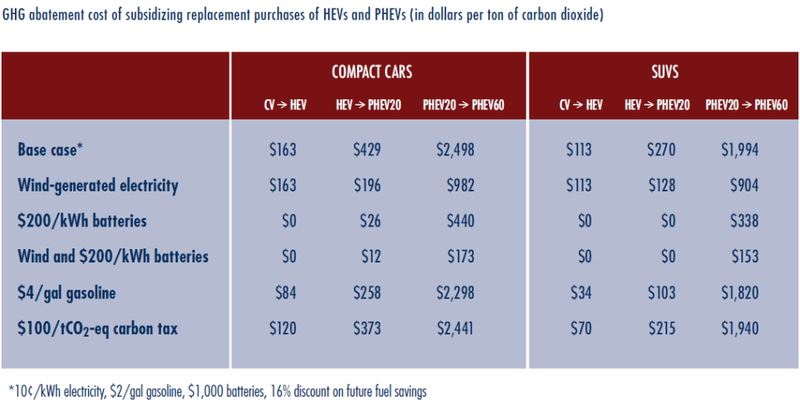 Figures 4 and 5 additionally show that it is more cost-effective to replace conventional SUVs with hybrid or PHEV SUVs than to replace conventional compact cars. This is simply because the same percentage increase in fuel efficiency (e.g., in miles/gallon) saves more fuel when the initial fuel efficiency is lower. An even better and more cost-effective way to reduce GHGs, of course, would be to replace conventional SUVs with compact hybrids or PHEVs. This suggests that any automotive GHG-mitigation strategy should focus on reducing emissions from larger vehicles both by shifting purchases towards smaller vehicles and by improving the efficiency of larger vehicles. Under most market conditions, replacing conventional cars with hybrids is the least costly GHG mitigation step. However, with cheap enough batteries, replacing hybrids with PHEV20s can be cost-effective in its own right, aside from emission abatement benefits. Replacing PHEV20s with PHEV60s, however, is an expensive GHG control strategy under every scenario we consider here. These findings suggest that automotive emission reduction strategies should initially focus on vehicles with smaller and cheaper batteries. Nonetheless, vehicles with large batteries and all-electric vehicles may have more value for longer-term abatement strategies. 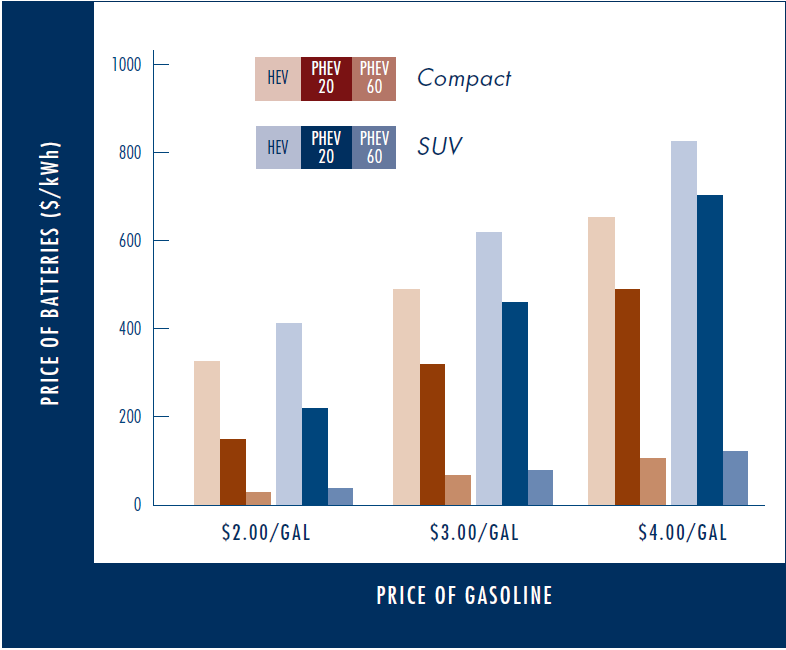 We conclude that for cost-conscious consumers to want to buy PHEVs, battery prices must decline to about forty percent of their current prices, or US gasoline prices must be roughly $5 a gallon. 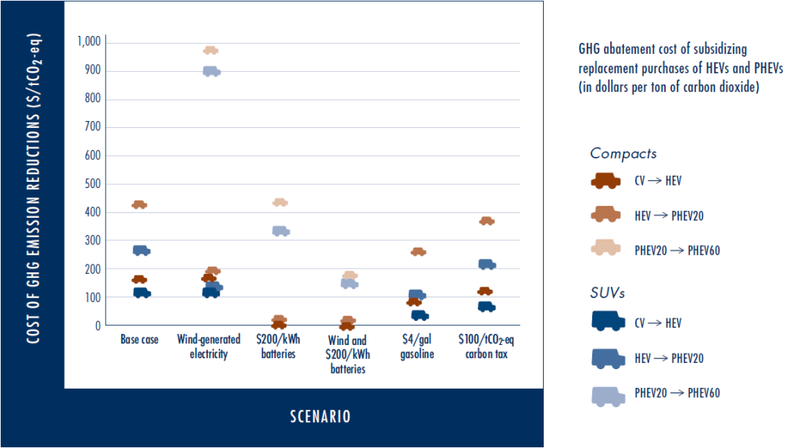 Policies to improve battery costs and lifetimes, to decrease greenhouse gas emissions from electricity production, and to raise gasoline prices relative to electricity prices can make the significant direct GHG emission reductions from PHEVs cost-effective. Legislators might enact policies supporting a broad program of battery research and development, with the goal of increasing battery lifetimes and bringing down prices. Policymakers might also encourage PHEV adoption by reducing vehicle costs or increasing vehicle benefits such as loans, rebates, feebates, tax incentives, or non-monetary incentives (e.g., preferred parking spaces or access to carpool lanes) to consumers who purchase PHEVs, and by raising the price of gasoline disproportionately more than the price of electricity. All of these policy options would require further analyses of their own costs and benefits. A second goal policymakers might pursue is to adopt policies (such as a renewable portfolio standard) that lower greenhouse gas emissions from electricity production and especially from marginal generators. Such strategies would in turn lower PHEV fuel costs and make them more attractive to consumers. 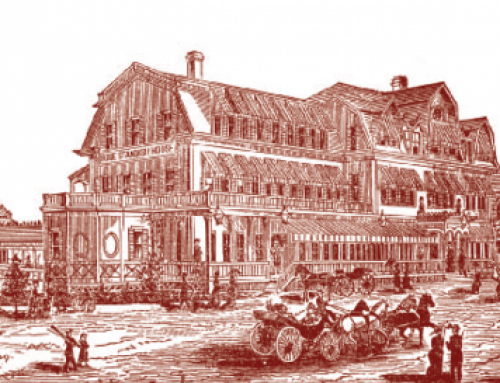 Research for this paper began as a course project at UC Berkeley undertaken by author Samuel Arons and James Wilcox, with the help of Richard J. Plevin. Timothy E. Lipman and Zack Subin (UC Berkeley), as well as John German (American Honda Motor Company), provided helpful comments on draft versions. We thank T. J. Glauthier and David Sandalow for highly insightful comments on this paper. 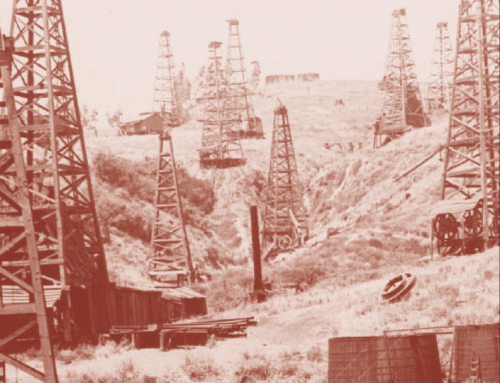 This research was made possible by support from: the Class of 1935 of the University of California, the Energy Foundation, and the Karsten Family Foundation (to DMK); and NSF’s Graduate Research Fellowship Program (to DML). We dedicate this paper to Dr. Alex Farrell, collaborator, colleague, and friend, who passed away in April 2008 during work on an earlier version of this project. Lester B. Lave and Heather L. MacLean, “An Environmental-Economic Evaluation of Hybrid Electric Vehicles: Toyota’s Prius vs. Its Conventional Internal Combustion Engine Corolla,” Transportation Research D: Transport and Environment, vol. 7, no. 2, 2002. 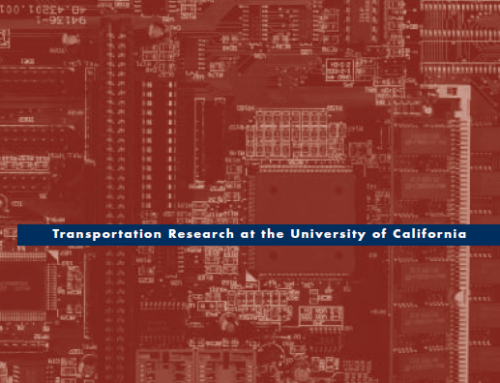 Karina Funk and Ari Rabl, “Electric Versus Conventional Vehicles: Social Costs and Benefits in France,” Transportation Research D: Transport and Environment, vol. 4, no. 6, 1999. 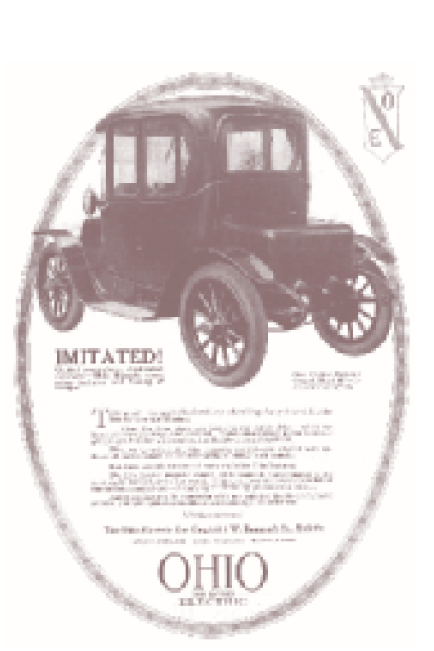 Derek M. Lemoine, Daniel M. Kammen, and Alex E. Farrell, “An Innovation and Policy Agenda for Commercially Competitive Plug-in Hybrid Vehicles,” Environmental Research Letters, vol. 3, no. 1, 2008. Costa Samaras and Kyle Meisterling, “Life Cycle Assessment of Greenhouse Gas Emissions from Plug-in Hybrid Vehicles: Implications for Policy,” Environmental Science and Technology, vol. 42, no. 9, 2008. Samuel Arons is an alumnus of the Energy and Resources Group and a member of Google's Green Business Strategy team (sarons@gmail.com). Derek Lemoine is an Assistant Professor of Economics at the University of Arizona. Holmes Hummel is a lecturer and policy specialist at the Energy Resources Group (hummel@stanfordalumni.org).